Original traditional Biosun ear candles. A relaxing therapy whereby candles are placed in the ear. The heat of the flame causes a gentle suction, which many people find beneficial. Now with a new safety feature - the newly developed, patented safety filter features staggered fins that completely prevent the risk of dripping wax. The open channel of the filter makes the earcandle even more effective. The rounded end of the filter fenrlt seals off the sear. Suitable for ears of all sizes. Biosun ear candles are made by hand using a traditional recipe and the finest regularly tested ingredients. Without compromise, only premium quality pesticide-free untreated cotton is used together with pure beeswax, honey extract, and traditional herbs such as sage, St Johns Wort, chamomile and pure essential oils. Original Biosun Earcandles are a wonderful and relaxing therapy used for the treatment of many ear, nose, throat, sinus and head conditions, such as vertigo, tinnitus, glue ear, itchy ears, and to prevent recurring ear infections. They help to clear the sinuses and blocked pressure in the Eustacian tubes and are recommended as a regular treatment for individuals who regularly fly or take part in deep sea diving. 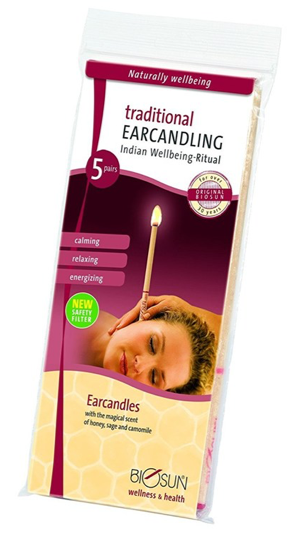 Full instructions for the safe use of ear candles are included with every pack. Unbleached Cotton, Bees Wax, Honey Extract and Indian Herbs such as Sage, St. John's Wort, Camomile. Warnings: The application of Earcandles is at your own risk and responsibility. If you follow the instructions carefully, the application will be secure and reliable. In the presence of a perforated eardrum or tympano stomy tube implants we strictly do not recommend the use of Earcandles. The same applies to all kinds of inflammations of the ear or skin diseases in and around the ear. For personal security we do not recommend you carry out the treatment by yourself. It should always be done by a second person. Disclaimers: Always read the label. The information provided on this site is intended for your general knowledge only and is not a substitute for professional medical advice or treatment for specific medical conditions. Always seek the advice of your doctor or other qualified health care provider with any questions you may have regarding a medical condition. The information on this website is not intended to diagnose, treat, cure or prevent any disease. Never disregard medical advice or delay in seeking it because of something you have read on the nutrisun.co.uk site.